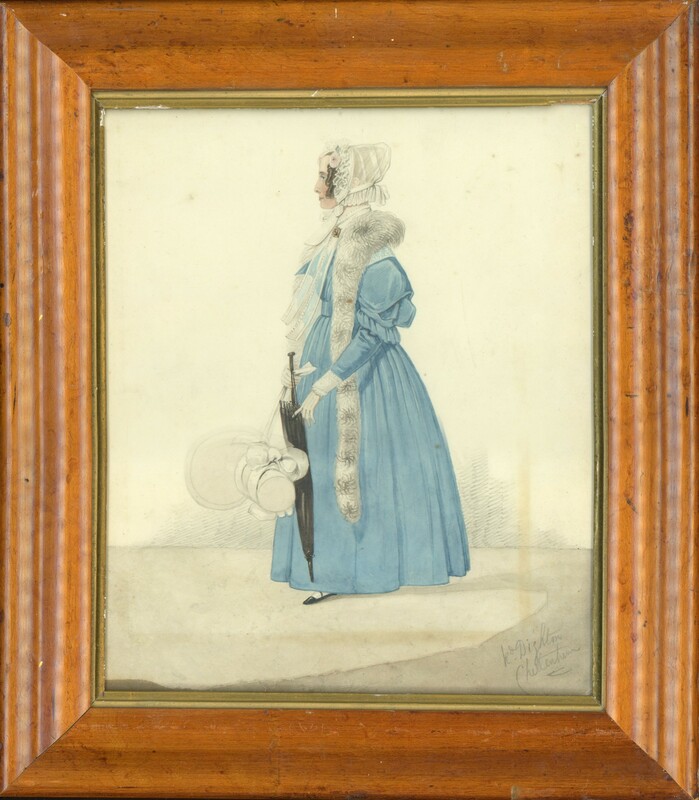 This watercolour profile shows a pretty young lady setting out for a stroll around Cheltenham. 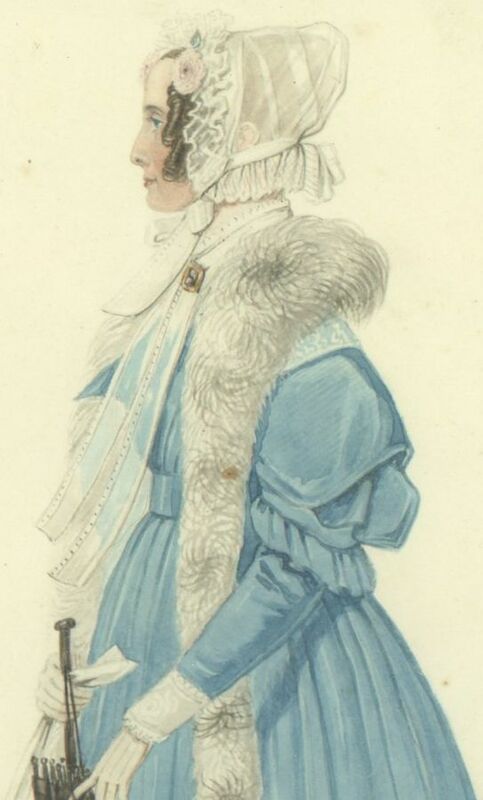 She is fashionably attired in a light blue dress with demi-gigot sleeves that are full above the elbow and then narrow down to the wrist. 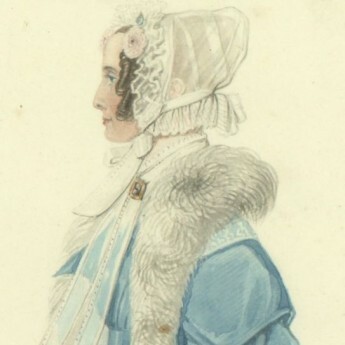 Her frill-edged cap is decorated with a pink rose to match her complexion and is tied in a ribbon bow under her chin. Prepared for whatever the English weather may bring, she wears a long fur boa and is carrying a large sun bonnet and umbrella. 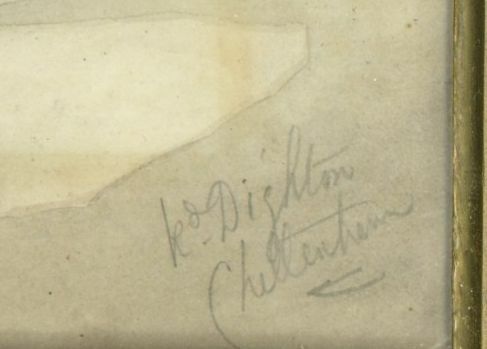 The portrait is signed bottom right in pencil ‘Rd Dighton / Cheltenham’. It resides in a bird’s eye maple frame with a gilt slip. There is some light browning perhaps caused by an earlier card mount. 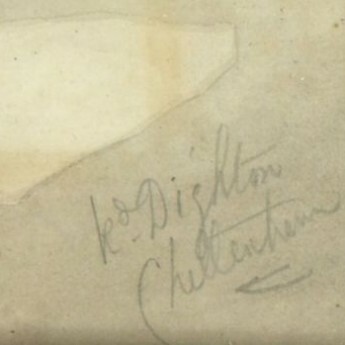 The Dighton family produced several artists over three generations. Like his father Robert, Richard Dighton (1796-1880) specialised in full-length watercolour profiles of city personalities, actors, politicians, bankers and aristocrats. The sitters of his portraits were predominantly men and provide an excellent record of the changing fashions of the time. He initially lived and worked in London but in 1828, by then a married man with a growing family, Richard Dighton moved to Cheltenham where he was guaranteed a good clientele from visitors to this popular spa town. 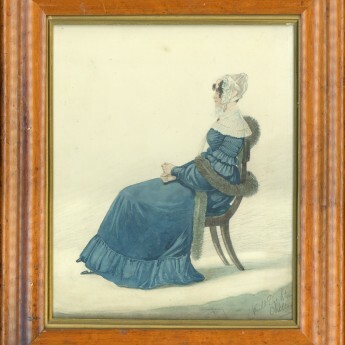 The Cheltenham Art Gallery and Museum hold a good collection of his watercolour portraits.